Beautiful, dry and sunny Arizona offers some of the Southwest’s most dramatic scenery and has long been a snowbird destination for thousands of Canadians each year, many of whom have purchased winter homes here or travel by RV each winter. Winter residents are big business in Arizona, contributing millions to the state’s economy. Most Canadian snowbirds in Arizona call Western Canada home. However, a growing number of snowbirds from Eastern Canada also migrate to Arizona in the winter, as it can be very affordable and has much to offer. Arizona shares its borders with New Mexico, California, Utah and Nevada and enjoys mild, sunny winters. The majority of snowbirds settle in golf and condominium communities, mobile home communities and RV parks around the Phoenix area. Most winter visitors stay in the Western side of Arizona, where daytime temperatures are normally in the 20C range. Arizona is a golfer’s paradise with well over 300 golf courses. Other activities include hiking, tennis, horseback riding, gambling, bird watching, cultural events, festivals and great shopping and dining. But it is Arizona’s warm, sunny climate and magnificent desert scenery that is the main draw for many snowbirds that come to winter under its vast and endless blue skies. The majority of Canadian snowbirds who fly to Arizona fly to Phoenix Sky Harbor International Airport either on flights from points in Canada or connecting through the U.S., although there are seasonal flights from Edmonton and Calgary to Phoenix-Mesa Gateway airport as well. You can also connect through U.S. airports to Tucson International airport. Many snowbirds from Western Canada opt to drive to Arizona by car or with their RV. Phoenix is the state capital and offers all the big city pleasures and amenities --great restaurants, entertainment, shopping and events. It also has the busy Phoenix Sky Harbor International airport with many good direct and connecting flights from Canada. The Phoenix area is also well positioned for trips to Southern California, Nevada and Mexico. Scottsdale is a city itself, located just east of Phoenix and one of the foremost resort areas in the United States. It has fabulous 5-star resorts, championship golf courses, spas, upscale shopping and restaurants. A number of affluent snowbirds own condominiums here. Downtown Scottsdale has wonderful galleries, museums and artist studios in the Arts District celebrating Old Western and Native art. Scottsdale also celebrates the Old West heritage with annual rodeos and other cowboy events. The greater Phoenix area is in a huge valley and the communities here attract the largest number of snowbirds each year to places such as Gilbert, Mesa, Tempe, Quartzite and Sun City. The area is home to many Major League Baseball spring training sites, and attending these Cactus League games is a major winter pastime. Mesa, a suburb of Phoenix lying about 20 miles east of the city, has long been a very popular snowbird destination with Western Canadian. To attest to this, it currently enjoys flights directly into Phoenix-Mesa Gateway Airport from Calgary and Edmonton. Mesa has numerous historic, geographic and cultural attractions with plenty to keep snowbirds busy, as well as their families when they come to visit. Gilbert has become a home-away-from-home to many Canadian snowbirds. Just 30-minutes southeast of Phoenix, its central location offers short travel to some of the state’s most beautiful attractions, including the Superstition Mountains, Tonto National Forest, and Saguaro National Park. Gilbert is home to the Riparian Preserve, the premier bird watching facility in the Phoenix metro region featuring hiking, biking, and equestrian trails, camp sites, and the only astronomy observatory in the valley. Transportation is easy with many local bus routes that connect directly to Light Rail stations. Gilbert is also 20 minutes from Phoenix Sky Harbor International Airport and 15 minutes to Phoenix-Mesa Gateway Airport. Gilbert’s Heritage District is the place to explore local cuisine, peruse weekly farmer’s markets, and discover local art. Quartzsite is near the California border where there are a lot of inexpensive and even free camping areas. In the winter, Quartzite's population explodes with snowbirds seeking a low-cost winter options. For the most part, the campsites in this area are no frills, offering basic services. You’ll find shopping in the commercial area nearby. Glendale is another suburb of the greater Phoenix area, just northwest of downtown Phoenix and on the way to Sun City. Known as the antique capital of Arizona, the University of Phoenix stadium is here and has played host to two Super Bowls, including 2015. The Arizona Coyotes of the NHL play at the Gila River Arena and both the Chicago White Sox and Los Angeles Dodgers share the Camelback Ranch Glendale spring training complex, giving snowbirds lots of sports activities to enjoy in the winter. The Westgate Entertainment District keeps snowbirds occupied with shopping, dining and entertainment experiences, and is not far from Historic Downtown Glendale. Located near the Mexico and California borders, Yuma is very affordable and has consistently warm weather. Snowbirds who like to try their luck appreciate the nearby casinos. Because Yuma is near the Mexico border, snowbirds enjoy visiting the Mexican border towns for shopping and to enjoy Mexican food. Tucson does not attract as many snowbirds as the Phoenix area but it certainly gets its fair share, and snowbirds love its historic charm. Tucson enjoys predictably warm, mild winter weather. Located about 100 miles south of the Phoenix area and only an hour’s drive from the Mexican border, Tucson is well situated for exploring southern Arizona and Mexico border towns. The city itself is a blend of the Old West, Mexican and Native cultures and this can be seen in its arts and cultural events. Downtown Tucson is culturally rich, with opera, a symphony, ballet, theater and great restaurants. There are a variety of accommodations including single homes, condos, RV Parks and mobile home communities. 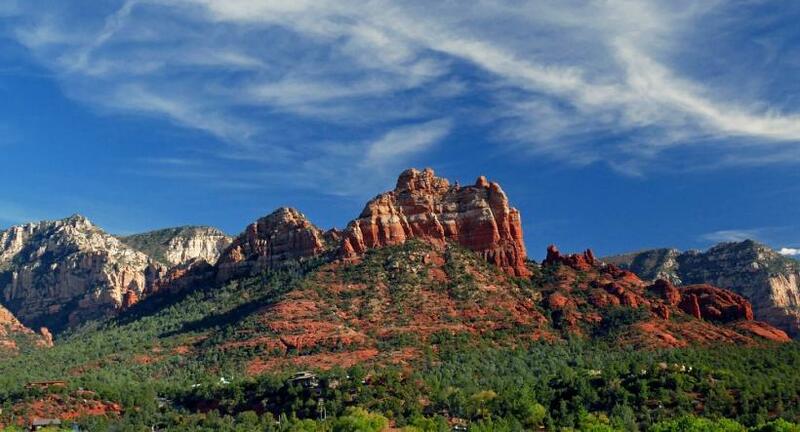 Lovely Sedona is a desert town near Flagstaff surrounded by pine forests, canyons and red rock formations. The town has a flourishing arts community and a new age vibe. There are jewellery boutiques, spas and lots of galleries. Snowbirds love to explore the dramatic scenery of Red Rock Park where you can hike, bike, go bird watching and explore. The Grand Canyon National Park is north of Sedona. Snowbirds have discovered a number of border towns in Arizona that are close to Nevada, including Bullhead City near Laughlin and Lake Havasu City, both on the Colorado River, as well as Fort Mohave and Kingman nearby. The whole area is growing rapidly. Snowbirds can visit Lake Mead National Recreation Centre, the Hoover Dam and Lake Mohave from here. Of course the casinos in Nevada are also a big draw. Watersports on the Colorado River or Lake Mohave are popular, as is fishing. There are also many golf courses to enjoy.